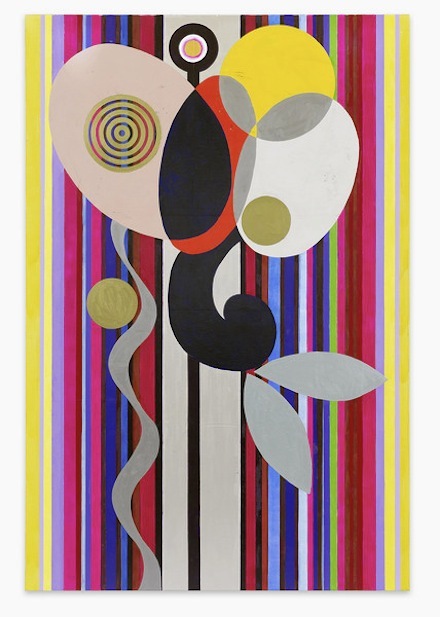 Beatriz Milhazes, Gamboa Seasons Autumn Love (2010). All photos via Galerie Max Hetzler. 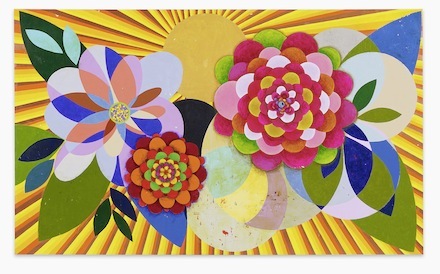 Brazilian artist Beatriz Milhazes begins Berlin Galerie Max Hetzler’s season with four large paintings, collages, and a mobile. The paintings are titled after the four seasons and continue the artist’s engagement with bold, colorful explorations of familiar objects and ideas taken as geometrical abstractions. 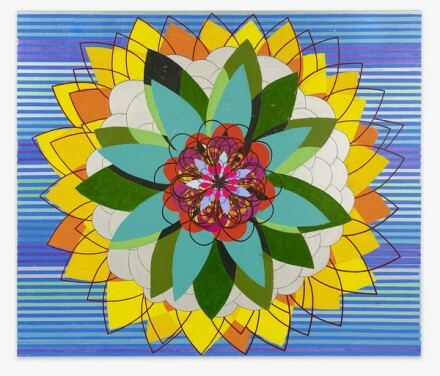 Beatriz Milhazes, Gamboa Seasons Summer Love (2010). Hetzler’s voluminous Wedding space easily accommodates Milhazes’ four large paintings. Gamboa Seasons Summer Love, which is over 9ft x 16ft (300cm x 500cm), is first in the series of the seasons placed on a division wall in the main gallery space. This painting consists of three geometrical flower patterns, composed of soft reads and brilliant blues, superimposed over what looks to be a sun with yellow, orange, and brownish rays shining outward. Summer Love, and the other ‘seasons,’ no doubt stem from Milhazes’ tropical locale—Gamboa, in the Bahia region of Brazil, more specifically. The other seasons, Autumn Love (2010), Winter Love (2010) and Spring Love (2010), create a sense that there are no seasons in Gamboa, for all but one of the paintings, Gamboa Seasons Winter Love, have floral motifs, and even that painting maintains a somewhat floral feel. 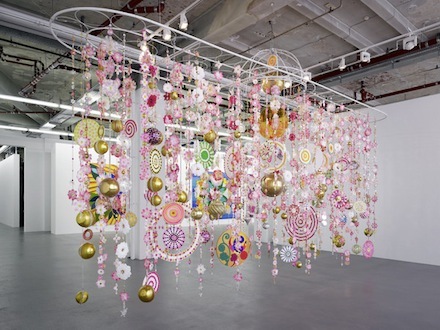 Beatriz Milhazes, Gamboa Seasons Winter Love (2010). Milhazes’ collages, of which there are several, escape the plant world and enter more abstract territory, although the colors remain bright, and the works are (somewhat) reduced in scale. The collages are composed of candy wrappers, whose brand marking is visible, arranged in patterns reminiscent of pop art with overlaid circular patterns. In Manjary, for example, horizontal lines behind the vertical semi-cirlces remind the viewer of the severe abstraction, while the candy brand name (Toblerone in this case) adds a more poppy feel to the piece. The mobile Gamboa, which was included in Milhazes’ recent show at Fondation Beyeler in Basel, is quite large in its own right, measuring in at 15ft x 16ft x 4ft (470cm x 510cm x 146cm). Using elements typically found on the floats of Rio’s Carnival Parade, the piece includes mirror balls and flowers, seeming a float of sorts itself. 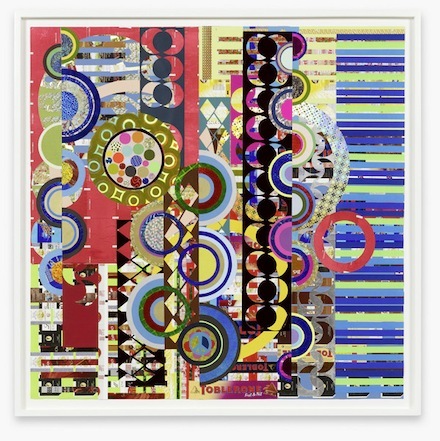 Milhazes’ work calls to mind Matisse’s paper cuttings and Bridget Riley’s early work, but bypasses those works’ minimalism, giving the viewer a more lively, or carnival-esque, experience. Her work has recently been shown in Fondation Cartier pour l’art contemporain (2010), and in New York’s Museum of Modern Art (2007). The exhibition can be seen in Berlin through November 5, 2011. 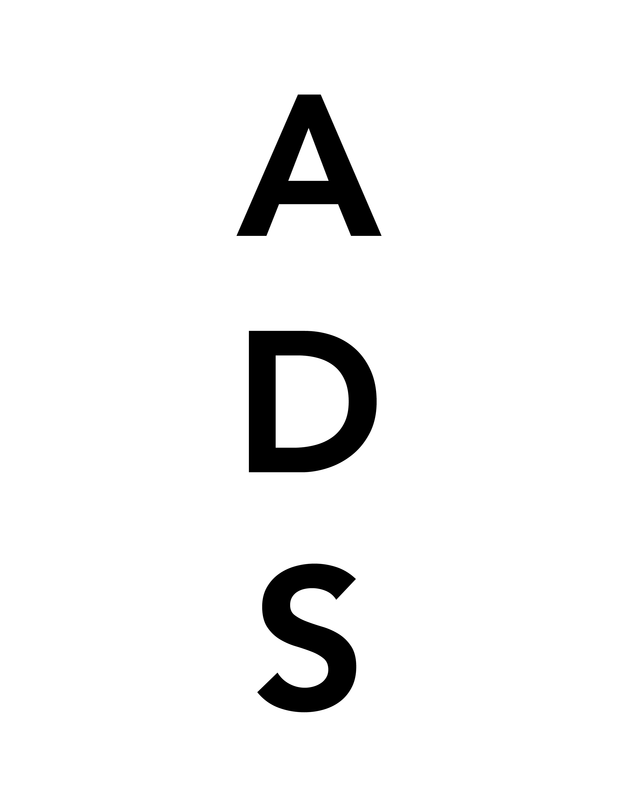 This entry was posted on Thursday, September 15th, 2011 at 9:28 am	and is filed under Art News, Go See. You can follow any responses to this entry through the RSS 2.0 feed. You can leave a response, or trackback from your own site. I am selling my art on ebay. Steve Barton is the artist. If you like the beach you may like his art.